For at least Wednesday night, the Fresno State women’s basketball team looked different than it has in the past few games. 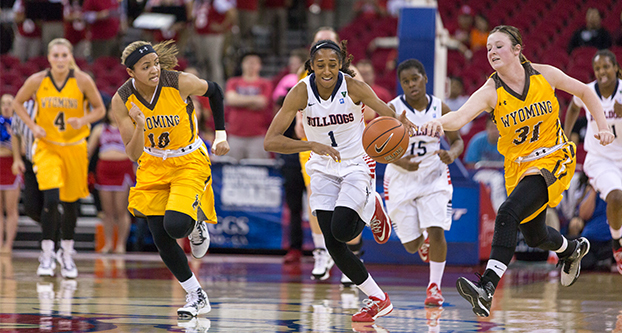 In the 67-50 victory over Wyoming, the Bulldogs pressured the Cowgirls and improved ball control. Fresno State cut its turnovers nearly in half from the previous game, only committing 12 compared with Saturday’s 22. That was enough to put a smile on Fresno State head coach Jaime White’s face. Fresno State was able to prevent Wyoming’s X-factor, Kayla Woodward from scoring behind the arc, a spot where she was efficient during the teams’ earlier matchup. Wednesday, the senior forward was only 1-for-2 in 3-point shooting. The Bulldogs led from the beginning and never let up. They held the Cowboys to 42.3 percent shooting in the first half and only 20 percent 3-point shooting. Wyoming guard Marquelle Dent led her team with 16 points and shot 50 percent from the field (8-of-16). Senior forward Alex Sheedy led the squad with 25 points, her second-straight game shooting more than 20 points. Center Toni Smith had 12 and guard Robin Draper added 10. The win keeps the Bulldogs in third place in the conference, a half game behind New Mexico, who beat Boise State 63-50. Fresno State will head to Albuquerque, New Mexico, on Saturday to battle for the second-place spot.